Whew, what a weekend! Seemed like we were on the go practically every minute! It was all fun stuff, though, so it was a good one! Friday, I took the day off from work to hang out with Jacob since he is still on Fall Break, and we had a busy, busy day. 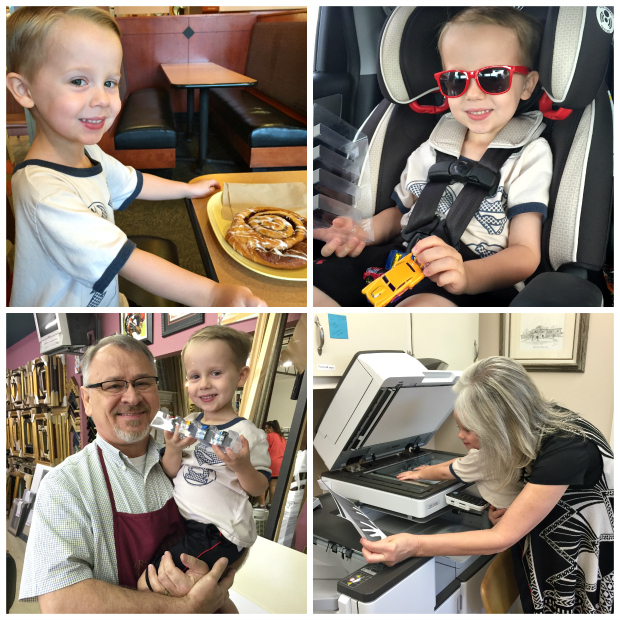 We started the day out at Panera for breakfast… Jacob loves their cinnamon rolls almost as much (or maybe even more) than he loves donuts! And I’m OK with that, because I was able to get my Cinnamon Crunch Bagel with Hazelnut Cream Cheese. Heavenly. 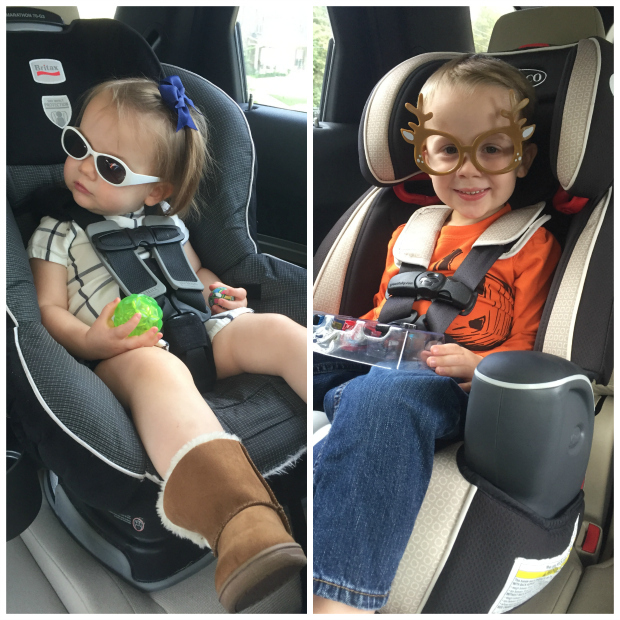 After Panera, we had some time to kill before the next big event (Chuck E. Cheese's for lunch), so we went to Target. We perused the aisles for a good hour and left with a cart full of Halloween goodies, a costume for Olivia, and a little something for mommy to wear for our fall pictures. On the way to Chuck E. Cheese's, we made a stop to visit my dad at work, followed by another stop to visit my mom at work. Every time we visit my mom now, Jacob always asks to copy his hands on the copy machine. Ahhhh, life’s little pleasures. 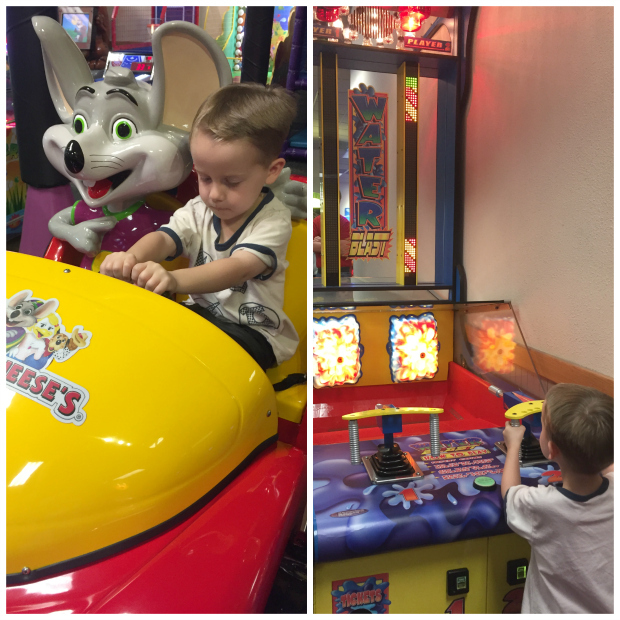 Chuck E. Cheese's was (thankfully) very slow, so we pretty much had the place to ourselves. Jacob played some games for a little bit, Brian met us there to eat pizza, and then we played more games. 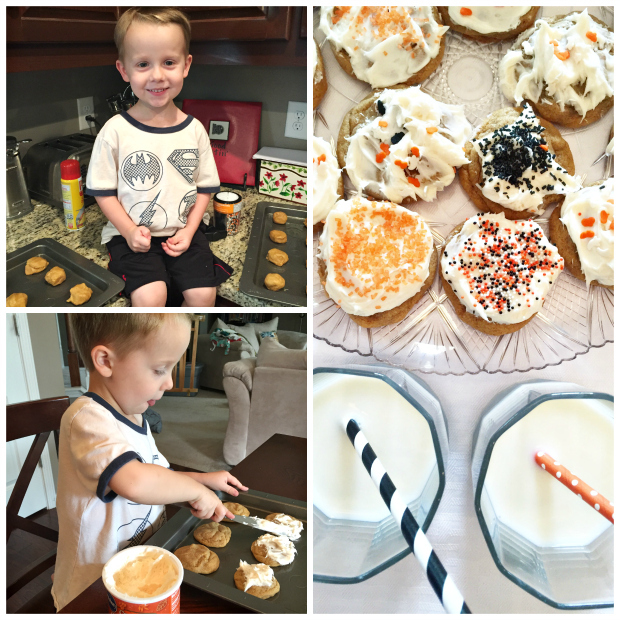 Afterward, we headed back home, spent some quiet time on the couch together watching cartoons, and then we baked Halloween cookies. Jacob frosted his own and he was so excited that I let him use a knife! Haha. Jacob had a birthday party to attend immediately after the yard sale, so he and I left as the yard sale was winding down. 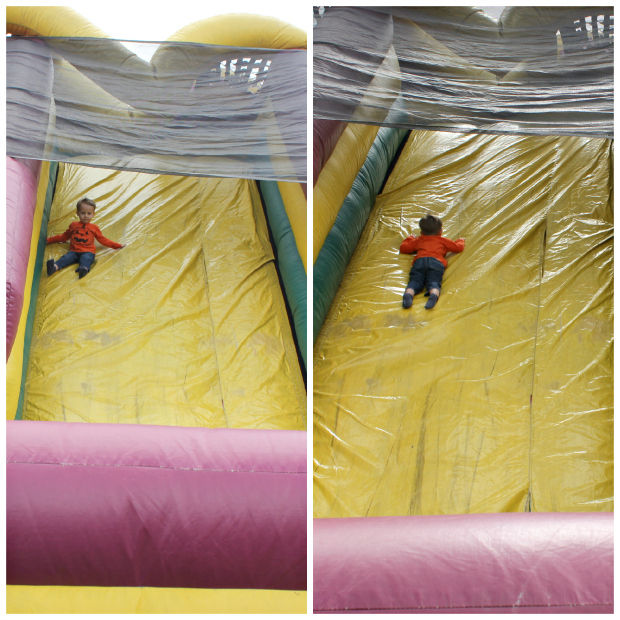 The party was at a gymnastics place, and Jacob had the best time doing all of the activities. He got to jump in a big pit of foam, jump on trampolines, walk on balance beams, and swing on the parallel bars. Our usually timid child seemed to flourish at the party, and it made me wonder if we should sign him up for gymnastics lessons to help him get over some of his fears. Sunday, we made some pumpkin waffles for breakfast, lounged around for a bit, and then I met my girlfriends for lunch. One of my besties moved to Atlanta two years ago, so we only get to see her every few months now. I sure do miss her face!!!! Sunday afternoon we had perfect weather for the pumpkin patch. In the past, it’s been boiling hot when we’ve gone, so 73 degrees and overcast was perfect (although it would have been even better if had been about ten degrees cooler). We did a little exploring, the kids picked out pumpkins for their rooms, and Jacob played on the GIANT bouncy slide. It was so huge that I was scared to watch him go down the first time. Another check on the fall bucket list! Thank you so much! It was! Yes, that one on one time was just what I needed with him. It's so nice to have him all to myself for a change! Sounds like the absolutely perfect weekend (minus your team's loss)! Your weekend sounds perfect! The pumpkin patch pictures are adorable, and I LOVE your scarf! Alright, first of all, your Friday looked like so much fun, and cinnamon crunch bagels are my favorite. Second of all, your children are so incredibly adorable! The photo of them hugging!!!! Also, the pumpkin farm looked like such a blast. Glad you had such a wonderful weekend! Your kids are soooo sweet. 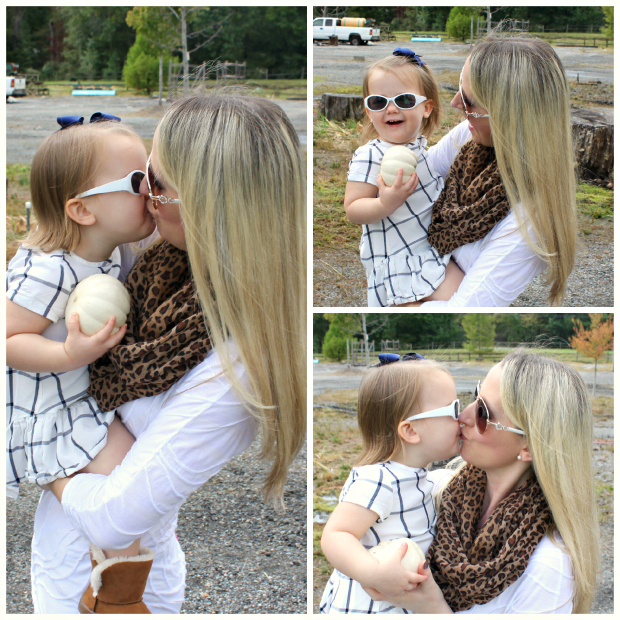 I absolutely loved all of these pumpkin pictures - I especially loved the ones of your kiddos holding each other and then the one of Jacob looking down where you can see the reflection of the pumpkins in his sunglasses. So precious. Your car is incredibly clean. How do you do it? I'm officially requesting a blog post on your secrets! LOL! #kiddingnotkidding My car is always a disaster! And girl, that is my husband's car, and it's new so we just haven't had time to dirty it up yet. Hahahaha. My car is older and there are toys/dirt/old food/trash strewn all over it! I really need to clean it out! Phew! I was all like, "I can't keep up with that!" LOL!